Smooth corns and calluses. 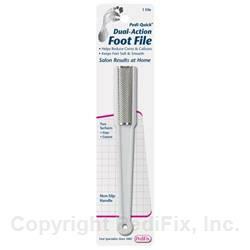 This handy file features a fine emery surface to reduce rough, dry areas and a coarse stainless-steel surface to help remove extra-hard skin. A non-slip handle provides precise control. 1 per pack. Before use, we recommend soaking your feet in warm, soapy water to cleanse and soften skin. Dry thoroughly. With repeated strokes in same direction, move file across affected area to take off unwanted skin. Stop use if area becomes painful or irritated. Hand wash in warm soapy water. Rinse thoroughly. Air dry before reuse. Do not use this product if you have diabetes, or a circulation disorder. Do not use on foot warts.